delivers classic Kirby action with a fun twist. Using the stylus to control Kirby's movements is surprisingly intuitive, and the new control scheme provides many unique gameplay challenges. 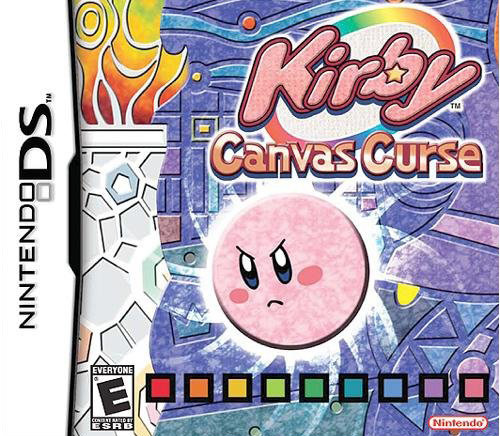 The rainbow paths you draw guide Kirby through the game, but they also can protect Kirby from falling icicles, lasers, cannon blasts and other hazards. In addition to drawing paths, the stylus can also be used to stun enemies, destroy barriers, detonate bombs and much more. Each of the game's seven levels is divided into three stages, and each stage holds three hidden medals. Some are easy to find, while others are either well-hidden or heavily protected. You can also earn medals by completing other tasks in the game. You don't need to find these medals to complete the game, but the medals you recover can be traded in to unlock special features like new ink colors for the paths you draw with the stylus. Tap Kirby to dash into enemies and copy their abilities. Turn into Wheel Kirby, Burning Kirby, Stone Kirby, and many more. There are 11 Copy Abilities in all!